If I were asked to add an eighth sin to this list (don’t know why this would happen since seven is a magical number in Christianity), it would have to be the sin of racism. 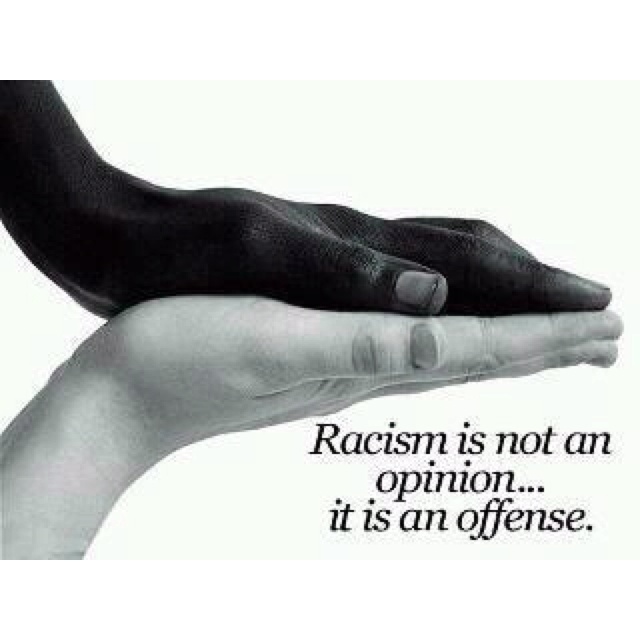 Racism – prejudice, discrimination, or antagonism directed against someone of a different race based on the belief that one’s own race is superior. In this day and age, racism is just unacceptable. We should all be respectful and accepting of one another, working together to make the world a better place, not trying to break it apart. Racism is probably one of the stupidest things to ever plague the entire human race. It’s like excluding certain colors from the crayon box, only using certain ones because they are more superior, are favored. Being racist is being ignorant, being unaccepting of the way culture has changed, how the world has progressed into more unity. Noone is born a racist; they are taught and influenced by those around them. Anyone who has parents who are racist (like mine, unfortunately) probably should already realize that their grandparents were also racists, and their great grandparents as well. It’s up to the current generation to break the cycle, to stand up for what they believe in, instead of going with the same beliefs that have caused a division between the most intelligent and evolutionary species to grace the planet.